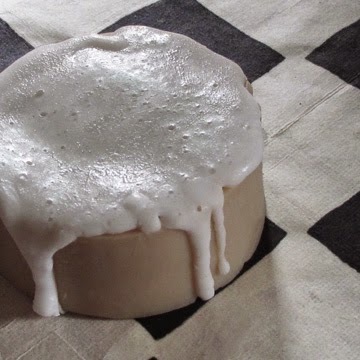 Usually, I'm a cold process or cold process/oven process soap maker—but every once in a while, I'll use a little melt and pour. I think of it as cheating. Like when my mother uses store bought pie shells. My Foamy Beer Soap—which is always a huge seller at The Hell's Kitchen Community Garden's Annual Perennial—is a melt and pour cheat and it's super easy to do. 1. 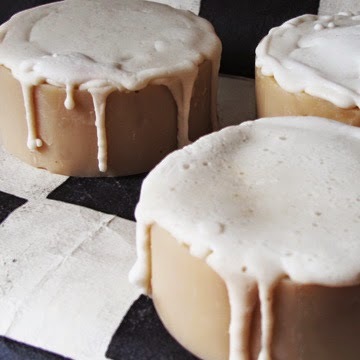 Make a batch of beer soap in circular mold. I have a terrific recipe for it, but you'll have to read Deathbed of Roses to get it (See how that works? Clever, huh? ).Cut into desired sized bars. 2. 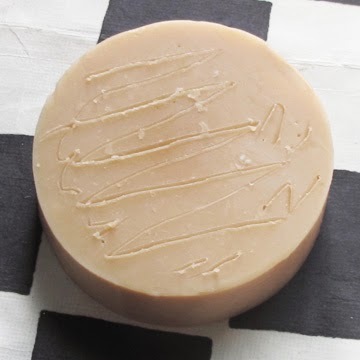 While the soap is still freshly-cut, score the top of each bar to give the melt and pour something to grab onto. 3. Melt the melt and pour. Do a little—about an ounce—at a time. 4. Use a small whisk to whip air into the melt and pour for that foamy effect. 5. Slowly—very slowly pour the melt and pour soap over the scored side of the bar. Let it pool up, mound and drip, but don't overdo it. 6. When the melt and pour is cool to the touch, you can remove any unwanted drips with your fingernail. 7. Cure as usual. And no, the melt and pour won't 'pull away' from the cold process as it cures. Where do you find deathbed of roses? Just not right to not give out the recipe like this.